NASDAQ and IEX – Sue Everybody! Browse: Home » 2018 » March » NASDAQ and IEX – Sue Everybody! NASDAQ says IEX violated seven patents involving end-of-day auctions, how orders are matched in general, and data feed operational details. NASDAQ’s suit seeks to halt IEX’s use of its technology, as well as seeks monetary damages. NASDAQ argues that former employees were hired by IEX in the development of its trading platform, and that its closing auction process is based on designs of other exchanges including NASDAQ. NASDAQ specifically alleges that IEX’s closing auction feed is similar to the NASDAQ Net Imbalance Order Indicator. NASDAQ’s lawyers have been busy! Six months ago to the day, they sued the Miami Stock Exchange – also for violating seven patents, and also for using technical know-how from former NASDAQ employees. And let’s not forget that NASDAQ threatened to sue the SEC back in 2016, if it were to approve IEX’s exchange application. But wait – that’s not all! NASDAQ wrote three separate comment letters insisting that the SEC reject IEX’s exchange application, and they met with them several times as well. If you had the pleasure of reading Scott Patterson’s “Dark Pools”, you know that nearly all of the modern ECN’s and stock exchanges have the same DNA – that of Josh Levine’s Island ECN. Levine. In fact NASDAQ still uses Levine’s source code, or parts of it. This is source code that Josh Levine released free to the public on Island’s 10th birthday! If you click on this link and scroll to the bottom, you see verification! Can NASDAQ claim patent infringement for processes that have been released to the public for free by the original owner? We suppose lawyers will have fun with that one. IEX started trading back in late 2013. It is now 4 ½ years later, and only recently has IEX announced that they will try to compete with NYSE and NASDAQ for corporate listings, which would necessitate IEX running opening and closing auctions. NASDAQ did not sue IEX back then, they did not sue IEX for patent infringement in the SEC comment process, and it did not sue IEX when they became an approved exchange. 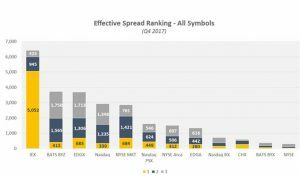 It is now, where NASDAQ feels their monopolistic strangle hold on trading around the closing auction is being attacked on all sides, that they file suit against IEX. And Miami. Also recall that NASDAQ is experiencing increasing competition to its trading around the close from other fronts as well: CBOE (BATS) intends to run a competing end-of-day auction. Also recall that HFT firms have been having a tough go, and have been in decline for several years, prompted by a speed race to zero. NASDAQ tops all other exchanges at 62%! So what’s really going on? NASDAQ, an exchange that sells speed, whose execution quality is inferior to that of IEX and CBOE, wants to defend its monopolistic strangle-hold on all that speed demand and trading volume around its closing auction. It is not doing so by making changes that make its experience better for investors; it’s doing so through lawyers, lobbying, and lawsuits. Perhaps the lawsuits that NASDAQ should be thinking about are the ones they may have to defend, as the courts have ruled that the selling of commercial speed and data is not a protected SRO activity that warrants lawsuit immunity. But that’s a story for a different day. ← Flash Crash Spoofer Aids CFTC in Finding Other Spoofers, Which Include Big Banks and People Who Served on the CFTC’s Technology Advisory Committee. Wait What?